﻿The OSLP Arts & Culture Program breaks down barriers to participation in the arts for people of all abilities. We are a leader in inclusive community arts for people of all abilities. Our vision is achieved through its diverse and inclusive classes and workshops, on-and-off site exhibitions, mentorships, and unique community collaborations. On Friday, April 5 from 5:30-8:00 PM, the “Object Afterlife Art Challenge” Opening Reception and Awards Ceremony will celebrate the work of the inspiring artists who accepted the challenge. The public ceremony and exhibition will take place at Oregon Supported Living Program (OSLP) Arts & Culture Program’s Lincoln Gallery, 309 W. 4th Ave. Suite 100, Eugene. Now in its 11th year, the Object Afterlife Art Challenge is the Materials Exchange Center for the Community Arts’ (MECCA) most popular and well-regarded annual event. Participating artists receive a mystery bag of materials, MECCA Money, and two months to create their pieces. The resulting artwork will be on public display, with an awards ceremony, during the First Friday ArtWalk and at the Metamorphose Earth Day event. The Object Afterlife Art Challenge elevates the realm of re-use art, engages the local art community, inspires the creative re-use of unwanted materials, and raises awareness of our universal need to re-imagine the objects around us in a thought provoking and creative way. This year, 104 artists, of all skill levels and mediums, signed up for the challenge, the most ever to participate. The artists are to create with what are often considered waste materials and turn such scraps into art, with the desired result to be works that exist in the space where artistic discovery and conservation meet, inspiring us all to think differently about the materials we may consider waste. This year, MECCA is collaborating with the OSLP Arts and Culture Program to exhibit the show at the Lincoln Gallery. This lovely, light filled gallery space will allow each artists’ challenge creation(s) to be prominently displayed and reach new audiences including a greater number of attendees and artists. ​Awards will be given to artists for pieces selected by local judges in addition to a public vote for best of show. Awards will be announced on April 5th at 6:00 PM with Lane Arts Council’s First Friday ArtWalk arriving at 7pm. This year’s judges include Isaac Marquez, the City of Eugene’s Cultural Services Director; re-use sculpture artist, Jud Turner; Angie Marzano with Lane County Waste Management; Lori Macedone, local re-use artist and “raining” SLUG Queen Slugita Incognita. Registration is now open for our next round of quarterly classes starting Tuesday, April 9th. To see a list of this coming term's class offerings, days/times, instructors, and to register, go to our Quarterly Classes page. ​Paper clay is a fun, flexible and forgiving medium that can be shaped, modeled and carved to create 3-dimensional art pieces. This air-dried clay dries to a durable, lightweight finish that can be painted or left natural for great results. Paper clay is a perfect medium for all skill levels. Participants must be 15 years and older. A community showcase of unique artwork inspired by the idea that anything can be a canvas for creativity. For more details, register below or see our Call to Art page. For a list of size requirements, due date, and where to submit your work, head over here. If you are ready to start your submission, click the button below. Subscribe to our newsletter to find out about upcoming events, workshops, and exhibitions. dedicated volunteers who ensure that classes, exhibitions, and events are a welcoming and amazing place to be! Do you want to be apart of our wonderful team of volunteers? Sign up below to join us! Days of Culture Winning Image! 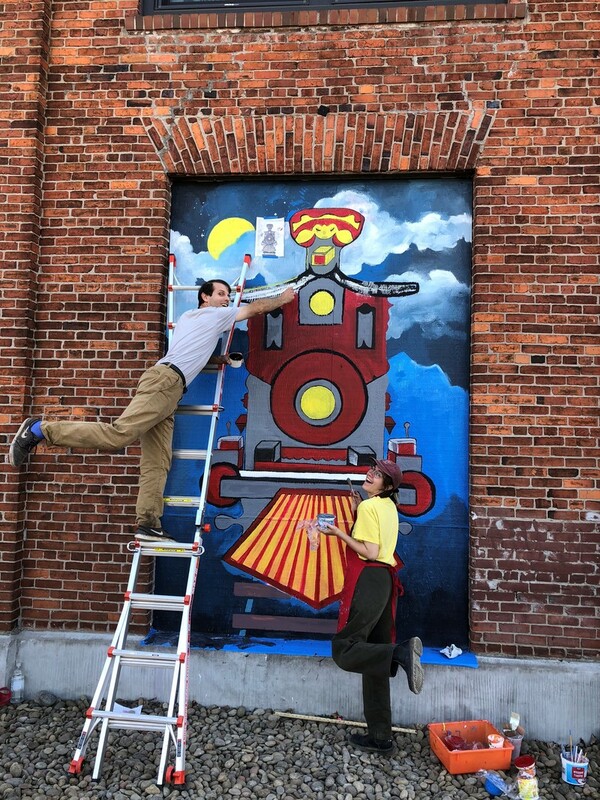 Volunteers Zachary Moen & Kailey Ruiz add some finishing touches! is art is the work of noble hands.